I raised my voice just once when my son opened the freezer to grab an ice cream after I repeatedly told him he couldn’t have dessert. It was a quick “no,” entirely justified, and it never escalated beyond that. Granted, today was not only Sunday but Father’s Day so I had an extra set of hands to help deal with the craziness. We kept the kids busy with sports and the pool. But even on weekends, and sometimes especially on weekends, spending an entire day with my kids can really test my patience. Years ago, as a teacher when my students would misbehave, I would stand quietly in front of the room and just wait. Yep, just wait. The silence caused them to stop, look at me, and they would redirect their focus back to me. I even recall teaching an entire day of classes with a case of laryngitis while holding up signs telling my students what to do for the day. Why would someone who could control a room of thirty-two middle-schoolers with simply a look need to raise her voice with her own children? This very question led to the creation of my 30-Day Challenge. As a new mom, when you look at your babies or your toddlers, you are so enamored and they are so helpless that you just don’t raise your voice. No, no, you tell them, and smile. But as your children grow and their personalities develop, they grow defiant. You pride yourself on your strong-minded children. But soon, you need to give them warnings and time-outs, you reward and you punish, and then you find that the only thing that works is yelling. They react, “oh, mommy is angry,” and they self-correct. Until, one day, you yell, they ignore, and the next day you yell some more, they ignore some more, and you realize, you need to make a change. Day 3 made Days 1 and 2 possible today. I managed to play with my kids in the pool (Day 1) and compliment them several times today (Day 2). So, will I yell when my daughter can’t find her shoes and she is late for school? I hope not. It’s a matter of perspective and patience. I know how important today’s challenge is to me and my kids. And, with that, here is tomorrow’s challenge . . . In my family, our iPhones are never turned off, never far, and never ignored. This challenge will be another tough one but I’m ready to tackle it. Tomorrow. I’m looking forward to hearing everyone’s thoughts on Day 3’s challenge and the Challenge so far. Please comment below and share this challenge with your friends. 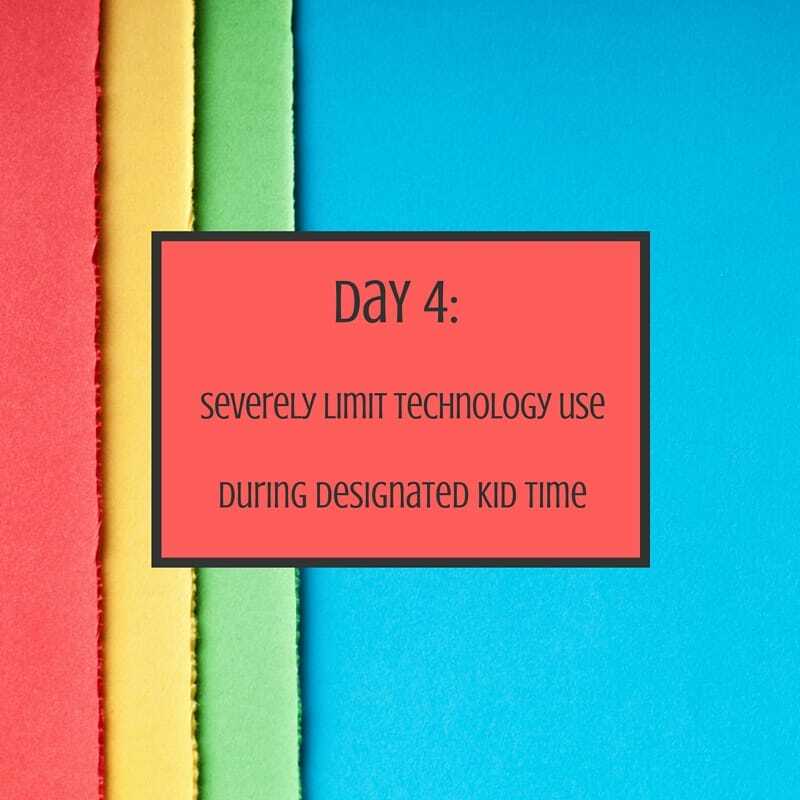 I have been much more on top of this one (limiting my technology while with my kids) since we went on a family vacation without wifi and I loved it. I find it refreshing to be out of reach.